I've been giving cryptic messages about a secret project for the last few months. Well, it is time to make it real! This weekend I launched a comic called Quinton Harrison the Man from Earth. I have been working on the world and the character for the about 12 years now. I never exactly knew what to do with him and then after getting back into comics a bit decided to try my hand at making a comic! Quinton is kind of a love letter to all of the adventure stories I grew up on. Star Wars, Doctor Who, Indiana Jones, James Bond, all of these influences are there! I have been partaking in these stories all of my life and decided it was time to throw my action hero into the mix. With a bit of action hero, throw in a little space opera, and add a pinch of 60s and 70s camp TV and you have the universe of Quinton Harrison. The biggest challenge was that I had to learn all of this. While I have fiddled around with sketching and drawing I do cont consider myself an artist, but I really had no one else to fall back on so I decided to do the first few stories on my own. I spent time learning techniques and the best way to draw things to be manipulated in photoshop later. I have a stack of books and list of websites that have been incredibly helpful through the process of getting me up to speed. That said I stand by what I said, I am not an artist and I have no misconceptions that the art is fantastic Its not. But at the same time I am proud of it, and I am equally as proud of where it has gone to for the first proper issue. None of this would have happened however if it wasn't for an old High School friend that I got back in touch with. He is the one that made this happen. He took my ideas and made them make sense. He made sure I got things done and he helped me see my ideas through. I owe a lot of this to him. Quinton Harrison the Man From Earth has launched over at chaosandlogic.blogspot.com you can go there and see the five page prologue issue. We are in the process of finishing the first full length issue which will be available in print as well as online! We are taking these issue by issue so we hope to begin to get on a more regular schedule, but until we do we hope to have information for you in the mean time! Now that the cat is out of the bag I will begin posting some sketches and images that are relevant to the comic as well. Of course you can also be sure to find my discourse on fandom as I typically do as I get time to do it. So this is it. The day that my fandom has been building up to for . . . well 50 years. Today marks a momentous occasion, not only for Doctor Who and it's fans, but also in a way fandoms everywhere. Today is one of those days that you will be able to answer the question "Where were you when the 50th anniversary special aired. Not only is it a land mark for a sci-fi show in terms of longevity, of course it also marks the occasion of an amazing around the world Simulcast. People all over the world will have the opportunity to see the special at the same time. Now, I want you to think, when was the last time you can remember this happening for a sci-fi show. . .(Other than the announcement of Peter Capaldi). I mean movies are even released at different times around the world, so it must say something about the shows raging popularity. The best part about Doctor Who, though, is that it is an underdog story. Not the fiction but the story of how it even happened in the first place. Everything was against it. The producers and directors were often (from the very beginning) set up for failure, but they pulled through. Its amazing that the show made it the first 26 years, but now it comes back and it is literally at the top. This is important, because it has effected so many people in so many different ways. The show means so many things for different people. For many of my friends it has encouraged them to be courageous in the face of adversity. Thats a big deal. Others see it as a inspiration as to how to treat others. Still there are others who it has taught to hold their temper and how to use your mind in tough situations. For me, though, the show is an old friend who has been there for me, never changing, through good times and bad times. Growing up there was a story for every situation. This show has been like a comfort food for me. It has been there for me when the day hasn't gone right. it has celebrated with me when things have gone swimmingly. Its also been there to help wind away a boring day. Through this show I have also gained such good friends (real friends) :). When I was in knoxville I decided it was time that I did something to meet other Doctor Who fans locally. This connection is something I had never had the privilege of having before. This was during the last days of the wilderness years so doctor who fandom was not as prevalent as it is today. I decided to start a fan group, and to advertise I made flyers (this is something you used to do) and a website. There were a few responses here and there, but one of them, Martin, became a lifelong friend and now we co direct programming a t a doctor who convention together. This idea of a fan group never really died, and I kept doing with it, doing local conventions with the idea that I could meet other fans. . and it paid off. in 2008 (or 9 I can't quite remember), I did a panel at connooga, and struck gold. There were a few other fans, Jan, Kim, and Rachel. Together we formed a group called the TWA (Tennessee Who Authority) and as of this writing the facebook group has 593 members. IT has been a wild ride. Sometime after that meeting, though, I met Alan, the director of the timegate convention and We became fast friends as well. I got involved with the convention and the rest is history. I've been really blessed with all of these fantastic friends and so many more that I can't even name. Its really because of this show and the incredible community that is built around it. I think this 50th anniversary special is a landmark for so many things. For me it is the celebration of old friends and new friends! It is the celebration of becoming better people. It is a celebration of underdogs. It is the celebration of an old man who was brave enough to leave his home to have adventures and help people. Let The Celebrations Begin! Familiar Faces, Docudramas, and mystical sisters! 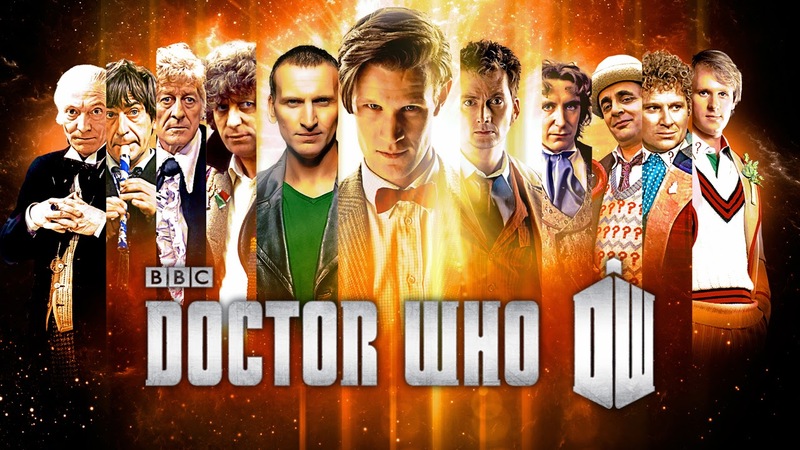 In about 8 days the world will be celebrating the 50th anniversary of Doctor who. I suppose that since this blog was originally created to talk about my travels through Doctor Who Fandom, it is a little odd that I have been mum on the subject of late. I also suppose it is time that I break that celebration, at least enough so that I can celebrate this momentous occasion. 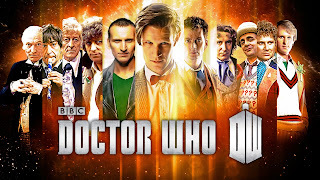 In terms of Doctor Who this has been quite a year, There has been the regular season of Doctor Who, 50th Anniversary ebooks, rereleases of older books, 50th anniversary Audios, Comics, and a wonderful 50th anniversary special from big Finish. We even had some old stories unearthed! But of course the one thing that every one is still talking about is the Official special that we are all waiting on. Its been teased for a long time now. Today part of that came to fruition. There have been murmuring for over a year that Paul McGann may be making some kind of appearance, probably on a minisode. Today those rumors were put to bed and they turned out to be true! Today McGann once again graced and official BBC production of Doctor Who, and it was perfect. For those of us who braved the wilderness years and survived it was not a disappointment because in one line, 15 years of or so of audio cannon was legitimized. While many of us already knew it was cannon - and could prove it - Today the BBC gave the nod. That is important. 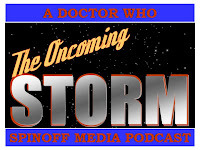 Not 2 weeks ago I posed a question on the facebook page for a podcast I am part of asking if "Spinoff Media should be celebrated as part of the history of Doctor Who." Today it was, I feel like we have a new life. McGann had a great energy and in a way reminded me what I love about Doctor Who. for the first time since 2005 we see a Doctor who has not been through the ravages of the time war. While this doctor is portrayed as trying to avoid the war, he has not been involved in it. He still feels carefree. He seems untainted by the idea o the time war. 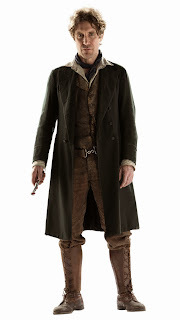 He is portrayed as an explorer and an adventurer, which is the way the McGann doctor, from the earliest drafts, was supposed to be. They hit it, right down to the new updated costume. Moffat nailed my image of the 8th doctor. I only wish we were going to get more of him, he was truly amazing in the less than 7 minutes that he was on screen. 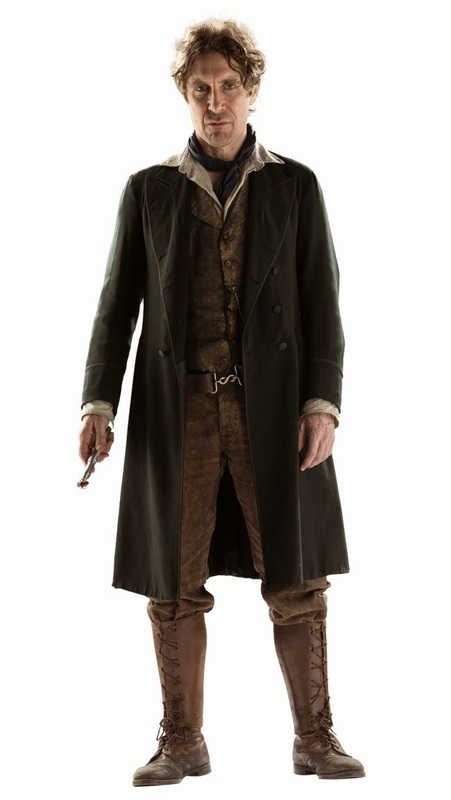 McGann's new costume in "The Night of the Doctor"
Of course while I think McGann was the best part there is more awesomeness. 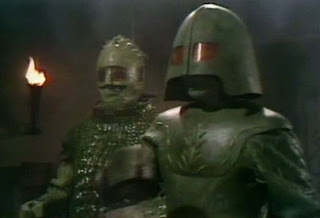 The Sisterhood of Karn, who first appeared in the brain of Morbius, makes an appearance as well as the harbingers of the the John Hurt "War Doctor". As much as Moffat says he hates to do it, he is playing a lot of fan service right now. Bringing back fan favorites and little bits of cannon. Seeing the sisterhood was a lot of fun to experience, especially opposite McGann's Doctor! I think we still have a few surprises in store for the actual special, but even if we don't, I think we just witnessed the most importance 6 minutes of Doctor Who since 2005. Perhaps it will bring some new who fans to the fold of spinoff media and then we will be fending them off of that as well. So, Thank you Stephen Moffat! 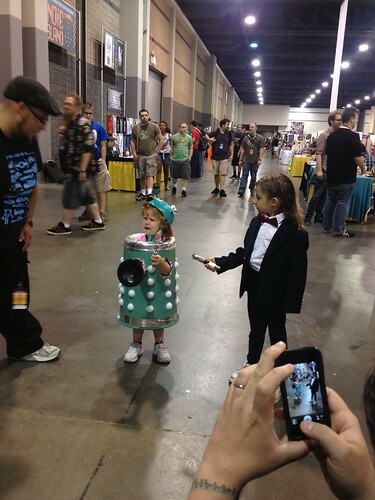 You made a lot of fan's day, while making a lot of new who fans scratch their heads in confusion. For that, I thank you! And of course in the tradition of when it rains it pours, we were also granted a first look at a trailer for the docudrama Adventures in Time and Space! It looks very swinging and I'm probably just as excited about that as I am the special that is coming up! What are you most excited about for the 50th anniversary! I'd love to hear your comments. I usually don't have dreams, and nightmares even less. I do however have a vivid memory of a nightmare I had a kid, about 5. The odd thing is that I recall having the dream twice. Its's strange because it is a dream that was so in line with the times. 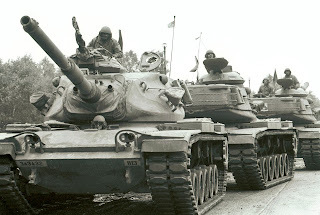 This would have been in the early 80s toward the end of the cold war (to give you some perspective) I was somewhere between 4 and 5 years old and, like now, didn't pay too much attention to current events! I was much more happy playing with my toys. The dream horrified me. I was in my house with my mom and my grand mother. I looked out the window and saw tanks and infantry turning into my drive way. My mom and grandmother freaked out and grabbed me and ran out into the woods behind our house and told me to be very quiet, and then we hid. All I knew was that the Russians had invaded. That was it. To this day I haven't figured out what triggered the dream. I'm sure it was based on conversations of my grandparents and my parents or other grown ups. I hadn't seen red dawn so that wasn't it. It is interesting to me because it seems that my young mind just soaked up the current events of the time and created into a horror story and made me dream about it. To this day that kind of hopeless feeling of capture/invasion horrifies me. So what are your thoughts? What is a nightmare you have had? Leave some comments, and feel free to psychoanalyze my 5 year old self! The League of Extraordinary bloggers is a fantastic group to be a part of, you should get involved! Also Check out some other posts from the league! Capaldi and the art of purging fans! I feel like I have to write this post. I know after yesterday everyone even remotely associated with Doctor Who has posted, or tweeted, or somethinged about the announcement of Peter Capaldi (I've got to get used to spelling that), but I wanted to put my two cents into the ring. 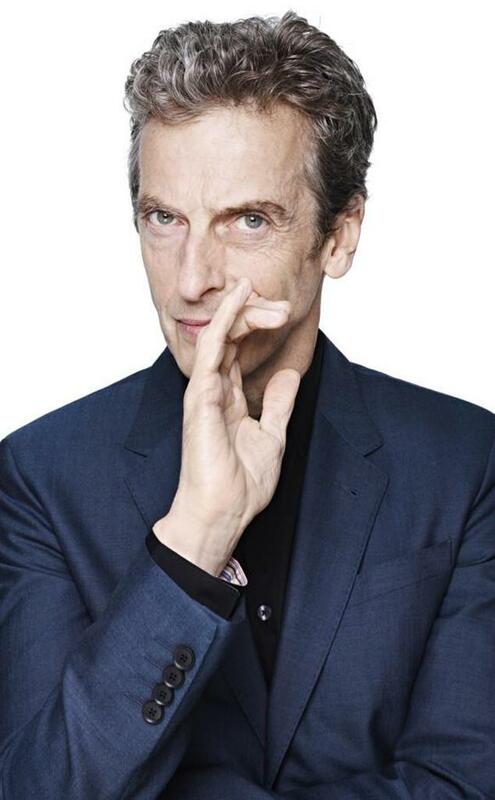 I'm not going to say much about the choice of Capaldi other that I think it was a great choice. I am 100 % behind this decision (at the moment) I think this is a dream job for Capaldi as he has been a documented long time show of the franchise, he has a history with it, and I think he will treat it well. I am excited to see what he does with the character. The big thing that I feel forces me to post on the topic is this. Peter Capaldi is the same age that William Hartnell was when he played the doctor, which puts him as being one of the oldest actors to portray our favorite timelord. This has been a point of contention. I think It always has. When Doctor Who was created they didn't really know what it was. The titular character of the doctor wasn't really the hero, that was left to the lead male companion (Ian). But the role changed over the years and the character of the doctor became more than just the catalyst for the companions to go from crazy adventure to crazier adventure. So finding and actor that could be a bit more versatile began to be an important part of casting decisions The doctor began to be a bit younger, but still in their forties and they were semi established actors. When Peter Davison took over he was young, there was a lot of concern about having a doctor that was so young. Then the doctor got to be a bit older again as the next two incarnations came and went! Then the new series hit. Christopher Eccleston was solidly in his forties and then David Tennant got a bit younger in his thirties, and then Matt Smith in his twenties. All of that is OK! The actors did their job perfectly, but with the younger actors came the change in the fanbase. The old fans still, for the most part, supported the show and enjoyed the fiction that was being created. Much of the new fanbase was also enjoying the show as well! There was, however another contingent. The contingent who could care less about the stories being told. The people who watched the shoe primarily for the personalities, the actors who were playing the parts. Perhaps for the "Eye Candy!" This is the group of fans who are saying "IF they go with an older doctor I'll stop watching" A statement which I find shallow and insulting. A statement that proves my point, that people were not interested in the fiction being created. They were not interested in the stories being told, but were concerned only about who they were watching. You can't honestly tell me that you love a show and are willing to drop it as soon as someone you don't approve of gets the job. The point of this post is really an observation that there are a lot of fans of the new series who are in the fandom, going to conventions, dressing up, and they don't even care about the franchise. They don't care about the stories, they are petty and shallow. What do they add? Do they care about the harritage of the show? Do they know/care about the wilderness years? I want to point out that I am generalizing a bit. I honestly believe this is a small part of new Who fandom. And I recognize that the new show can not survive on classic series fans alone. I love new series fans, but what I don't appreciate are the people that are so shallow that they won't stick around long enough to give an older actor a chance. Yeah there is a chip on my shoulder! What are your thoughts about this kind of fandom, about Peter Capaldi being cast as the next doctor, or anything else related, let us know in the comments below! 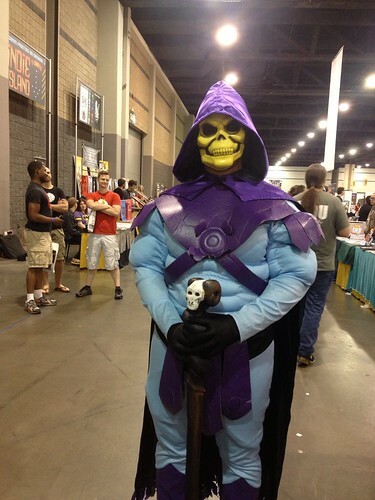 Wow, has it really been over a month since we returned from HeroesCon in Charlotte? All this talk of San Diego Comic Con reminded me, "Hey, stupid. 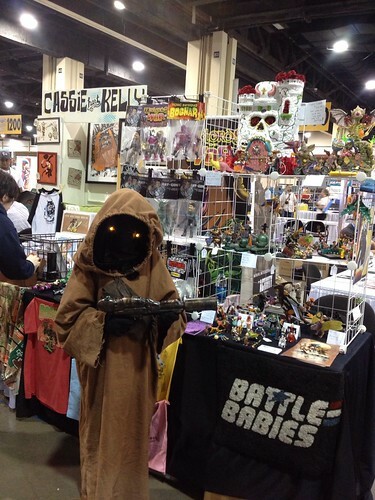 You need to write about HeroesCon!" (Life has really been getting in the way of my writing.) Honestly, it's probably a good thing there's some distance between this and my leaving HeroesCon. True story--I've cried like a baby the past two years leaving the show. 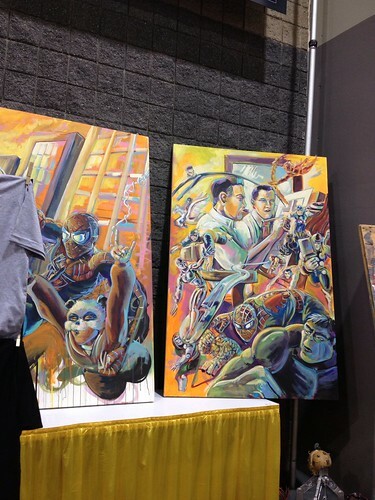 A lot of it has to do with the vibe of HeroesCon. It's like Comics Summer Camp. Shelton Drum has been putting on this convention for a little over 30 years, and it's his dedication and that of his staff that make Heroes a must stop on the convention circuit. 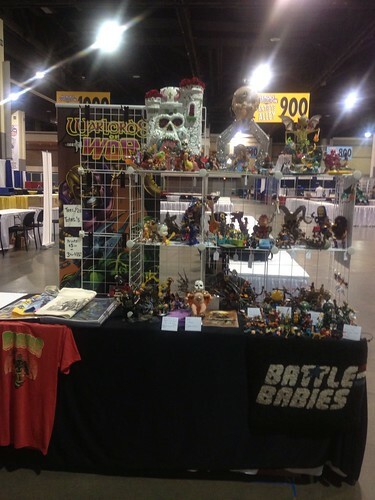 Like last year, I split my time between hitting the convention floor and helping set up/run the Battle Babies/ ManOrMonster? Studios table in Artists' Alley. Arriving early on Thursday afternoon, we were able to start setting up. Seeing a convention before it opens is a fun experience because it's an amazing transformation from a floor filled with half-erected wireframes and closed longboxes to a full-fledged bustling convention floor. This year, Shelton made the decision to make the convention double the space. Seeing it on Thursday, it seemed vast and empty, but by late Friday morning, we were thankful for the breathing room. (Having walked it several times each day, I can tell you it was still vast.) The extra space seemed to be a mixed bag--some artists and retailers said it helped their business, while others said it hurt them. From both sides of the table, I would say it was better overall. Artists had more breathing room, and convention-goers had more space to move. Artists' Alley is my favorite part of the show. Shelton, Rico Renzi, and crew always select a nice variety of artists and writers, from the tiniest of small press cartoonists to big current names like Amanda Conner to industry legends like Neal Adams and amazing artists like John Hairston, Jr. (his work is the colorful amazingness on the left). It's fun to walk around and meet people whose names you see every week in your comic shop. You can always snag prints, have them sign your comics, or even get a sketch. Most of the artists will do tiny scribble sketches in a sketchbook for free. Of course, if you want something more complex, each artist has his/her own rates. The sketches are great, but the fun part is actually getting to say, "Hey, I really dig this part of your work." It's definitely nerve-wracking sometimes, but it's also cool to see how artists/writers respond to that. One thing I'll say about Heroes--people are genuinely in good moods for the most part. I don't know if it's the vibe of the show or what, but most everyone I've talked to has been really cool. 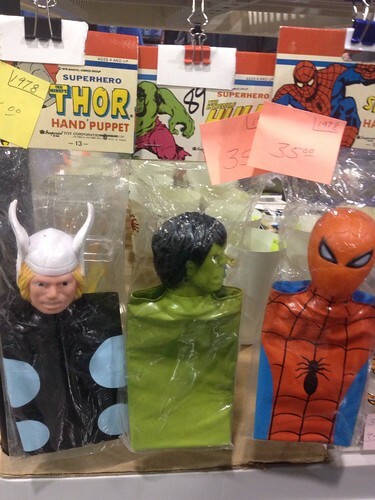 Of course, like any convention, there's a ton of merchandise to peruse. Vendors were selling everything from vintage comics of every condition and price, new comics and graphic novels, and vintage and new toys. One toy line that seemed to be everywhere was Funko Pop! I was beginning to think that was a requirement for vendors this year. Seriously, the majority of vendors had those things. It was a lot of fun to see. 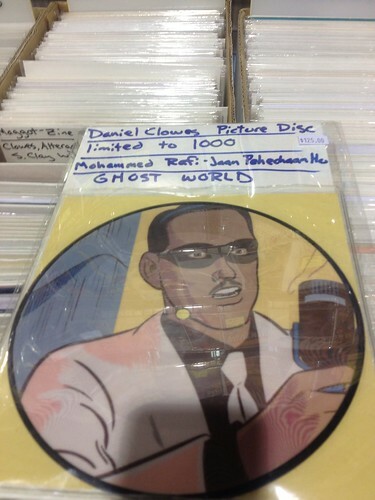 Things that stood out to me were things like this Daniel Clowes picture disc. Sadly, it was out of my price range to bring home, but it was incredible. Another booth had some great vintage items, like the vintage hand puppets. This guy's booth was amazing--he had 7-11 Slurpee cups, these hand puppets, tiny Marvel comics, and Dr. Doom and Darkseid vintage costumes. (I managed to grab the Darkseid, some Marvel finger puppets, a tiny Thor comic, and a Red Sonja cup from this booth.) Of course Heroes is also a great resource for comics, and the selection was incredibly varied this year. My collection is random, and I was able to find some Thor comics, some vintage underground comics, Masters of the Universe, even a New Kids on the Block comic! 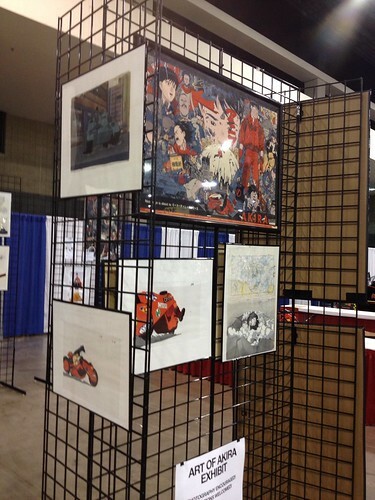 Every year I've attended, HeroesCon has had some kind of comic-related exhibit, and this year was no different. 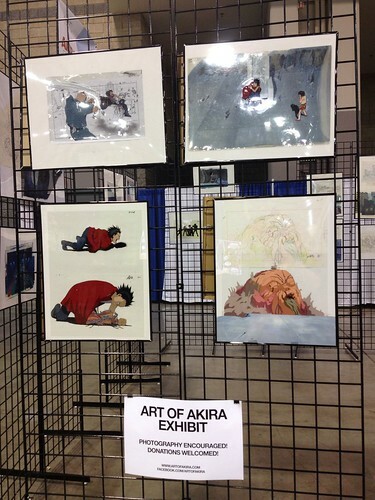 This year it was "The Art of Akira" and featured art related to the famous manga and anime. Skelly was a lot of fun. Just like any geek convention, Heroes had its share of cosplayers. You couldn't go very far without running into a Harley Quinn or a Captain America. Though I appreciate the comic-related cosplay, my favorites this year were TV/movie related. 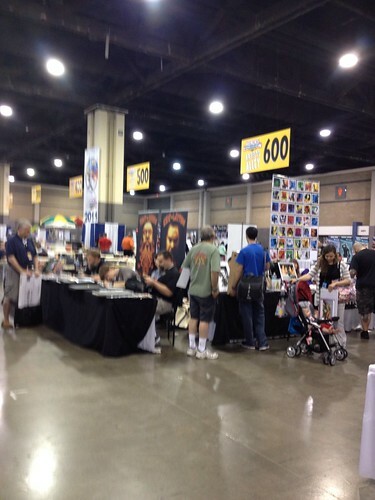 In addition to all the convention goodness, HeroesCon had a lot to offer at night. On Friday night, we attended the Drink and Draw. All proceeds from this event went to Team Cul de Sac, a charity related to Parkinson's Disease. We got drenched trying to get to the event, but that wasn't enough to dampen our spirits. We bought a few pieces drawn at the event, but I had more fun watching artists crank out sketch after sketch. The atmosphere at the event was very relaxed and lighthearted. Then we headed to the Westin bar, where many guests of the show head to unwind after a long day on the convention floor. Saturday night was the annual art auction, which is always a lot of fun. Sunday after the show ended, we were lucky enough to make it to the Dead Dog party and hobnob with our artist friends (and make some new ones). All in all, this year's HeroesCon was my favorite thus far, and I think a lot of it has to do with actually venturing out and doing things. In the past I've missed the Drink and Draw and never headed to the Westin bar, but doing so led to some pretty awesome conversations and great memories. 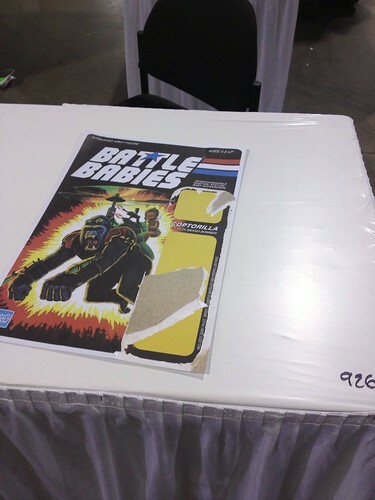 Thanks, HeroesCon. It was amazing. Can't wait to see you next year! The League: Swords colors and Plastic. . . My first experience with Ninja Turtles! It has been FAR too long since I have done a league post. I have been on a kind of indefinite hiatus, due to a larger project I have been working on. I am not going to say I am back, but I will try to be a bit more proactive about posting. This Week The League has charged us to "Write about your first experience with something." I will try to not disappoint. I thought about it and couldn't think of anything all that memorable or important (especially pop culture related) then it struck me. . . and that story will follow! This is an exciting year for Doctor Who fans, and I would be remiss if I didn't mention it. So I'll be remiss, because I want to talk about something else happening to Doctor Who this weekend, something that is very exciting for me. The Ice Warriors are back. 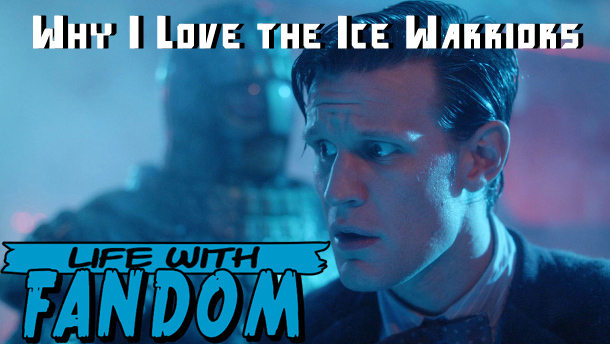 Those of you that know me or have read any of my Doctor Who Posts on this blog know that I have an unhealthy liking for the Ice Warriors. But I don't believe I have ever taken the time to explain why. In this post I am going to do that, In celebration of the return of the Ice Warriors I am going to let every one know why I love these second tier icy bad guys of the Whoniverse. 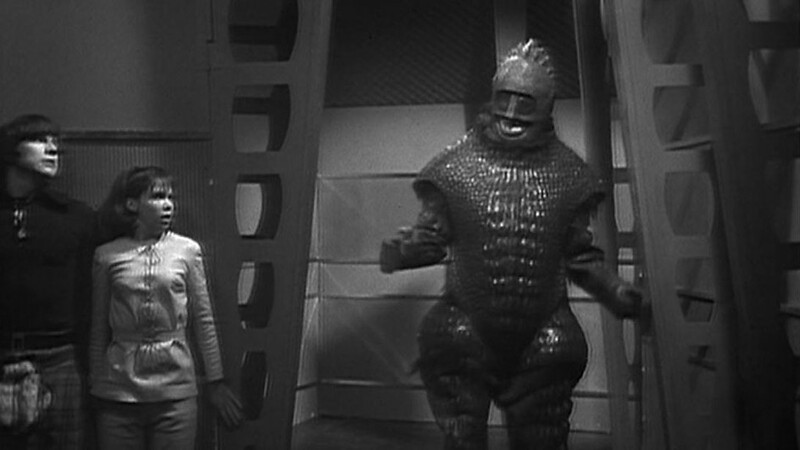 I got my introduction to the Ice warriors when I was very young with the Pertwee story the Curse of Peladon. This story has all of the elements I love in my sci-fi. A vast Space operatic federation, with intrigue, alien races, schemes, murder and a big fury monster. Within all of that though is a morality tale about racial discrimination. This story includes the Ice Warriors (or more accurately Martians) as part of the grand Galactic Federation. They are pitted to be the bad guy throughout most of the story, and the Doctor doesn't trust them, because he has encountered them before. But these Ice Warriors are not the bad guys, and in a way they even turn out to be the heroes by saving the Doctor. The story was great and had a great atmosphere but what I took away from it over 25 years ago is that the Ice Warriors (and Ice Lords) are awesome. I had never experienced a story, at least in Doctor Who, where the monster turns out to be the good guy, where the Doctor misjudged someone based on his past history with their race. Now that is not to say that it hadn't happened but I hadn't thought about it like that at my age. The story really spoke to me and so did the Ice Warriors. Unfortunately this is the only time (on TV) that the Ice Warriors have been treated like this. They were the villains in their previous 2 stories, and again in the sequel to Peladon, and unfortunately we never saw them again on the show. They have however shown up in novels and Big Finish audios and they have shown up as both the villains and the allies of the Doctor, and this is always exciting. This Idea that an alien race can have the same sensibilities as the human race really captured me as a kid and still does now. The idea that there are good Ice Warriors and Bad Ice Warriors is stunning to me. This story is a historical and appears to be taking place on a submarine. I have a feeling it is going to harken back more to the Second doctor's encounters with the Ice warriors, in which there is an ancient Ice warrior who came to earth from Mars during our Ice age and has been rediscovered and hence re awakened. 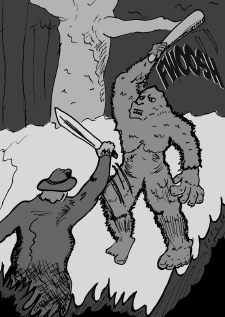 The Ice Warrior will be the villain in this story. While it is not the way I would bring the Ice Warriors back (I would bring back the Galactic federation and all of it's space opera glory!) I feel it will not let us down as being a good trapped inside with a monster story. I look forward to this story and hopefully it will be successful enough to bring the Ice Warriors back the way they should be brought back, with their honor in tact! Just as a note for those of you who don't know my name of the internet has been Izlear for about 15 years now. This of course hearkens back to Izlyr, the Ice lord from the Curse of Peladon. Why do you love the monsters you love in Doctor Who or any other show you love. Leave your thoughts in the comments below! Life With Fandom Updates and welcomes! It has been an incredibly long time since I have updated the blog. I have found myself working on a project (which should eventually be for the blog) that has taken me a lot longer to get finished than I thought it would, but on the bright side it is indeed coming along, so look for that in the upcoming weeks (hopefully). In the meantime I want to let you all know about some changes that are coming to Life With Fandom. Since the very beginning of the blog I have always wanted it to be about more than just me. It started out about my life in Doctor Who fandom, and then evolved into a toy and 80s nostalgia blog. All of these are things I love and am deeply involved in. That, however still hasn't really scratched the surface of what I wanted to do. I wanted to include others. I wanted Life With Fandom to be many people's lives with fandom. I wanted to document things people like! I am able to say I am doing that. It will be a slow rollout but Life with Fandom is growing. There will be more than just me writing on the blog. To begin with we are adding Brad and Stacy Rader, the creator of Battle Babies and the Geekyvixen herself. They will begin posting pictures and blog posts here on Life with Fandom as we begin to join forces and build the next version of the site. Other posters are also ready to come on board and will be introduced soon. We are also planning on expanding even more and we are going to be jumping into podcasts etc. The videos from New Monster will continue and will continue to be featured here, and of course my new project will be brought to you here soon too. So I hope I can actually live up to these promises this time. Hopefully you will hear from us all more often and soon! So be sure to welcome our first new contributors to the site!